Some kitchen knives have a type of blade called “Damascus”. Damascus blade has a beautiful wave patterns on it. The pattern is formed by its making process of overlapping the material (metal) in many layers. Because of the multi-layer, blade becomes durable, rust resistant and sharp. You may have seen this kind of beautiful knives. I saw these knives last weekend. They are sold in a department store in Osaka. They have beautifully decorated blades. They are sold for a price range of $300-400. Damascus knives are originated in the city of Damascus in Syria. Its beautiful pattern had been yearn of people at that time. Of course higher performance of Damascus blades were a reason for the popularity. In present, however, there are knives which don’t have Damascus blades but are very sharp and durable. Aritsugu, a very popular high performance kitchen knife maker in Kyoto, don’t have knives with Damascus blades. Because of recent high technology, Damascus blades are not the only way to realize highest performance. Furthermore, there are fake “Damascus-ic” knives which are not so sharp and durable. 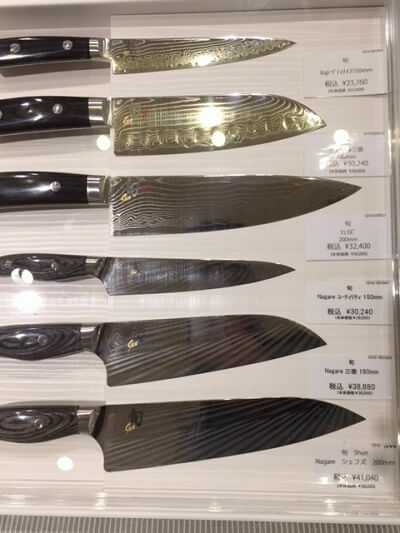 Those kitchen knives are sold for low prices (a few tens of dollars/euros) but have blades look like Damascus. I don’t recommend such knives because their quality tend to be poor… probably much portion of their making costs are used for its Damascus-like appearances. Therefore, the advantage of Damascus is its beauty and desires of possessions. I don’t intend to say such desires of possessions are bad. I have it, too. One of my Santoku knife is Damascus, and I’m content with the knife. What I intend to say is that knives should not necessarily have Damascus blade when it comes to cutting performance. There are non-Damascus knives with high cutting performance as much as authentic Damascus knives. Most chefs don’t use Damascus knives, actually. Hope this information will be helpful when you choose your knife! Season of cherry blossom has come!